These new templates for Pligg are simple but efficient. Silverbullet will be updated for future versions of Pligg. These templates are compatible with Pligg 9.9+. Keep checking back to download the newest versions and look out for more free pligg templates coming soon. SilverBullet has been updated to version 1.0. How do I install a Pligg Template? Navigate to your Pligg Admin Panel and click on the Configure link. Then under template you will need to change the name to the folder you uploaded into /templates. Of course, you don’t have to donate, but if you do so, it will encourage me to release more free templates. I think the download is broke please can you see about fixing it? Thanks for your dedication and hard work! Heu guy.. you’re a genius! thank u so so so much..
Hope this theme works well for me..
after I upload the theme contents to the server, the theme is not atall showing in the template management module 🙁 How do i activate the template ?? So smart template, thank you. Error: You may have typed the template name wrong or “Silverbullet” does not exist. Click here to fix it. “http://lajmeweb.com/templates/”, I don’t see it. It is also case sensitive, keep that in mind. Should fix it for you. I had that theme uploaded, than deleted, than uploaded again. Whatever, I downloaded the theme from here again and now it works. I have to thank you a lot man. I was giving up with pligg but you gave me with this theme a reason to use it. Thanks man, I appreciate it, i fixed the donation button. Thanks also to anyone who goes forward and donates, it will definitely encourage me to make more templates. can i use this for 9.8 version 😀 ? Great job.I cant translate the submit a new story button. Any idea? di ,that is a small problem I forgot to fix before releasing the template. This will be fixed in the updated version of the template. I fixed the submit a new story button, thank you ,but i get a 404 error when i try to open admin-template editor. Is any way to upload images with pligg silverbullet? This is a very nice simplistic template that loads very fast. Thanks. I hope you don’t mind I ported this over to work with SWCMS, footer link to qkin.com is still intact. Thanks. Maybe I can resurrect my abandoned site now. Is there any way to make the latest submited story to be shown in the front page same as http://www.veebeo.com ? But how can I change the color of the words on the topbar? and change the colors from #888888 to whatever you want. It wasnt a question , it was the answer for lipsmega .Thanks anyway your template is great. Ill donate for your great work. All of modules works great and is very fast the only problem i get is that i cant activate image module. Di, I have installed the image module on this template a few times, if you need more help just send me an e-mail. Hi, I like so much your template but i want to ask you a simple question. How to put the header buttons (popular,upcoming,submit…) near than the tittle Silverbullet?? hi, hey you dont need to answer the question last question! now i now how to change the place of the header buttons. anyway, I’d like to suggest: I’d like so much your template, but there’s no user’s photo at the main pages, no icons… just text. Does anyone have any input as to where to place the Google Analytics code within this template? I tried to place it in pligg.tpl but it resulted in an error message. is there an update for pligg 9.9.5 ? It will be updated for 9.9.5 very soon. But when? Hi, your theme is perfect! Absolutely great work! Silverbullet for 1.0 will be available Friday 13th of this month. Great! I’m very happy for your this plan! I think others is same as me. > Great! I’m very happy for your this plan! Sorry for the inconvenience. I have decided not to release the updated version of silverbullet untill pligg 1.0 Rc2 is released. Rc2 is rumored to come out sometime next week. i just downloaded your silverbullet template. Some things don’t work completly yet. I have Rc1 from Pligg so maybe you can already prepare before Rc2 comes out. Thank you for the information. I am not surprised with the issues you are having. Don’t worry everything will be fixed when I release the 1.0 version which should be this weekend if they release rc2 on schedule. 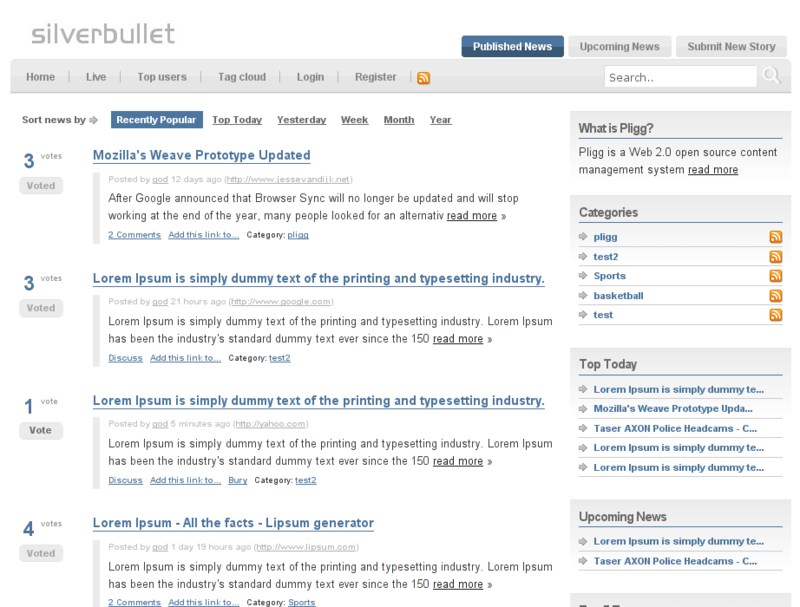 Great news hearing from you that a new silverbullet theme is on it’s way! Is there going to be an update for Pligg 1.0? any sugustion for fix it? I hope it’s work fine with the RTL Dir. very nice theme, I have used them in many sites, waiting for the newer version! This template is great, I await the upgrade for version 1.0 of Plig! hey, this template is amazzzzzzzzzing!!! Any idea when it will be released for pligg 1.0 rc1 !? I hope it’s soon, I can’t wait! I love this template so much. I am regularly visiting this site to see if you update and publish new vesrion of silverbullet. I am sure , as u said earlier you will be working on this..but to be honest, we can’t wait to get it as soon as possible. Your efforts are much appreciated. If possible can you please include comments feature in sidebar. Wondering if you could help me with this problem with the side bar? I tried chmod 777 for the file, but it didn’t help. The sidebar issue is related to the fact that the template hasn’t been updated for a while. The new version will be available soon, I promise. A newer version of Silverbullet has been released.